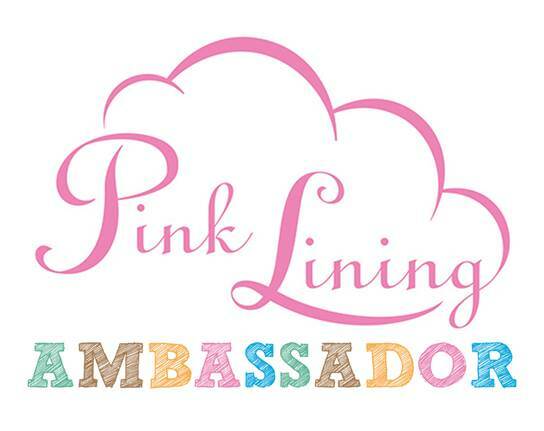 It turns out that it was exactly 1 year ago today that we wrote about being selected as Pink Lining ambassadors. I remember how special that was to us as it really was a dream come true to be able to tell others about a brand we love so much and that has had a big impact on our lives. As our year of being ambassadors comes to a close, I've been nostalgically looking back at how things have changed over the past year. Watching those videos we made last year, what strikes me most is how Miss T's speech has come along so much. She's gone from being a little toddler to being a proper little girl now. She has of course been through a lot in terms of her health too learning to live with Juvenile Arthritis. One thing that hasn't changed at all is our family's love of Pink Lining products. I've said it before and I will say it again...All of their products are of extremely high quality, exceptionally practical and functional and beautiful to boot with their gorgeous designs. Miss T was lucky enough to receive a Pink Lining Cats and Dogs Lunchbox last year and this year D asked for a lunchbox from their new AW16 Pink Lining Child range. It was the Captain Amazing design that really appealed to him. He's into his comics and loved the superhero theme with all the comic style words and pictures. This design seems to appeal to such a wide age range as I can imagine younger kids loving it right up to children of D's age - there's something special about Superheroes that has universal appeal! So the design ticks all the boxes. How about functionality and practicality? We love keeping plastic cutlery and a napkin in the mesh pouch. The lunchbox opens up wide which makes it a lot easier to clean at the end of the day. There is an elasticated loop for a drinks bottle. We used it to hold D's Yumbox, so we fitted a drinks carton in along the long edge instead of using the loop. Another thing we adore about Pink Lining is that they are constantly innovating, not only by introducing stunning new prints but with new products and making improvements to products too. 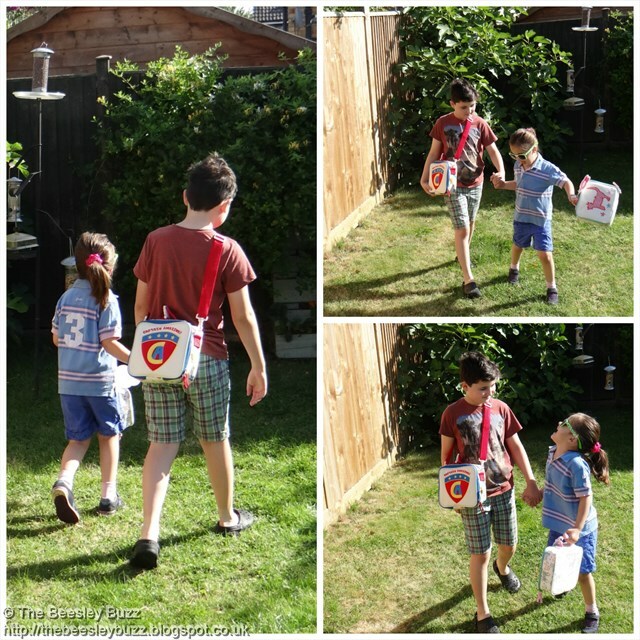 So not only does this Captain Amazing lunchbox have the usual small carry handle to hold, but it also has an over the shoulder strap which any parent will tell you will come in extremely handy for the school run journey. It makes it that bit easier for children to carry all the bits and pieces they need for school. As Pink Lining founder Charlotte Pearl's children grow, the product range seems to grow to meet the needs of her family (and families like mine!). So the Autumn/Winter 2016 collection sees the introduction of the 'Big Chaps Rucksack' in addition to the cute mini rucksacks they already do. Pink Lining kindly offered to send D one of these to match his new lunchbox but he said he was happy with his existing school bag. Needless to say, we were very excited by seeing the product range expanding in this way as we are very much hoping that new products will continue to be added to meet differing needs as my own family grows up! This post was going to be written in September as a 'back-to-school' themed post, but I was so inspired by the Captain Amazing lunchbox that we gave it a trial run with a superhero themed lunch today. An apple juice carton was covered with a piece of duck tape from the Duck Tape colours range. A bright post-it note was cut with crimped scissors and stuck on along with a foam apple sticker to show that it was apple juice. The words 'U R Amazing' written on the post it. In the larger compartment we have superhero 'capes' made from yellow and red peppers. Some superhero gadget 'buttons' made from cucumber and grapes and a wrap with a cheese star and peas from a fresh sugar-snap pea on the corners of the star. The bottom right compartment has 'planets' of varying sizes, including cherry tomatoes, grapes and blueberries. Top right compartment contains a babybel which seemed to look rather superhero-like already with the eye mask, along with Nim's Fruit Crisps made from Kiwi slices. We ADORE these 100% natural fruit crisps and they make such a great addition to kids (and grown-ups) packed lunches because each pack contains 1 of your 5 a day). The small round compartment has a superhero 'swirl' made from a wrap and ham slice rolled together and cut to size. D's Yumbox is a perfect fit to go inside the thermo-insulated Captain Amazing lunchbox. In warmer months I'd also pop an icepack in or chill the drink carton first to help keep his lunch cool. All that remains to be said is a massive thank you to Pink Lining for creating another awesome product with a fabulous design! 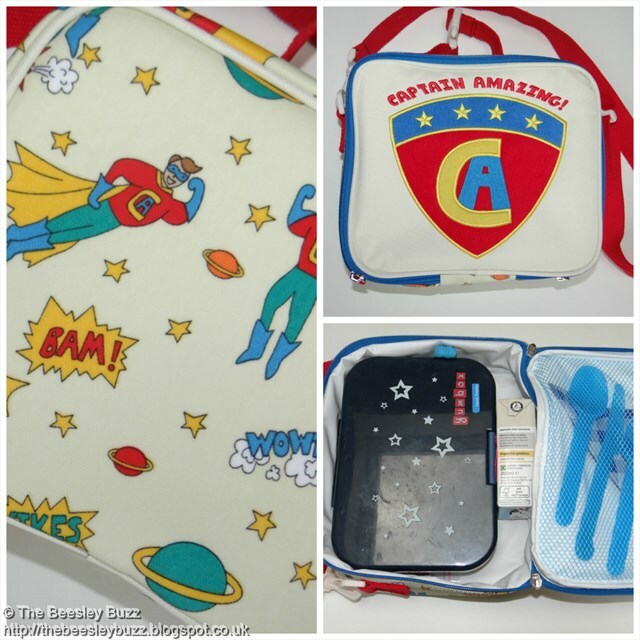 Disclosure: We were sent the wonderful Captain Amazing Lunchbox from Pink Lining to review. All opinions are our own. In the interest of full disclosure, I will be working with Nim's Fruit Crisps soon but mention them here simply because we love the product! It was 18 months ago that we heard the shocking news that Miss T had juvenile arthritis. Although it caught us by surprise we've felt better prepared than most because of my own experience of childhood arthritis. Still it has been largely unknown territory for us because when I was first diagnosed with arthritis a whopping 28 years ago when I was aged 10, I wasn't offered any of the treatment options that are available nowadays. We've tried to view things positively throughout. We've told ourselves that although compared to a 'normal' child, she's had a pretty rough time, she is so fortunate that with the Methotrexate treatment she is on, she is largely able to lead a normal life despite the side-effects. We had been so pleased with the progress she was making. Since the end of last year she has been doing around half an hour of physio excercises every evening at bedtime. For a child so young, I find it incredible how well she cooperates and knows she has to do them, never complaining. The weekly injections are harder as she knows they're painful and so these days she cries and pleads with us not to. But we have to. In the early days she showed such bravery and would calmy await her injection each week but a year and a half on with no end in sight she's clearly fed up of having to go through that each week. The blood tests to monitor liver side effects are currently down to one every 8 weeks so that is good. But those 8 weeks seem to come round pretty quickly as we cover her hands and arms with EMLA cream and cling film and head to the hospital. Her eye checks are currently down to every few months too as the methotrexate has kept the uveitis at bay. Anyone reading this whose child has been diagnosed with JIA, please please get them referred to get their eyes checked urgently for Uveitis. Miss T had initially gone onto the long routine appointment waiting list for this at our local hospital and it was only because her Great Ormond Street consultant told us how urgent it was that I phoned several times a day every day and got her seen urgently. Any longer and her sight could have been affected. Uveitis is one of the leading causes of blindness. So 18 months on and things seemed to be going well. The methotrexate had got the pain under control. The physio exercises were strengthening her muscles. She'd managed to avoid Chicken pox (can cause complications for children on methotrexate). When we saw her Great Ormond Street consultant a couple of weeks ago, we'd really hoped that there was an end in sight. But instead her left foot was showing signs of swelling again. Nowhere near as bad as the initial swelling I wrote about here, but swelling nonetheless. So another MRI - this time it will be in London and under general anaesthetic rather than sedation. These are the times we have to be braver than her. I remember all the mixed emotions running through me for her last MRI and the last general she had for a steroid injection. Again we have uncertainty. And no end in sight. But that seems to be the nature of arthritis in my experience. Unpredictable. Ongoing. But I know my brave girl and I know she'll keep smiling. As a mum, I want convenience when it comes to lunchboxes. I have three to make each morning so I need quick and easy ideas that are also healthy and fun for the kids. I'm always looking out for low-sugar or no sugar options to add to their lunchboxes so I was delighted to receive Hartley's No added sugar Jelly along with a lunchbox to share our ideas. As part of Hartley's #HartleysYourLunchbox campaign, you can collect 12 special edition lids and send off for your very own lunchbox and stickers too! There's more info on that here. My 3 kids are all at different stages of childhood and so I've come up with 3 simple ideas that would appeal to each of them. The great thing is that you can improvise with ingredients you already have and many of the ingredients are the same for all three lunchboxes so you can stick to the same shopping list of items and there's less waste. 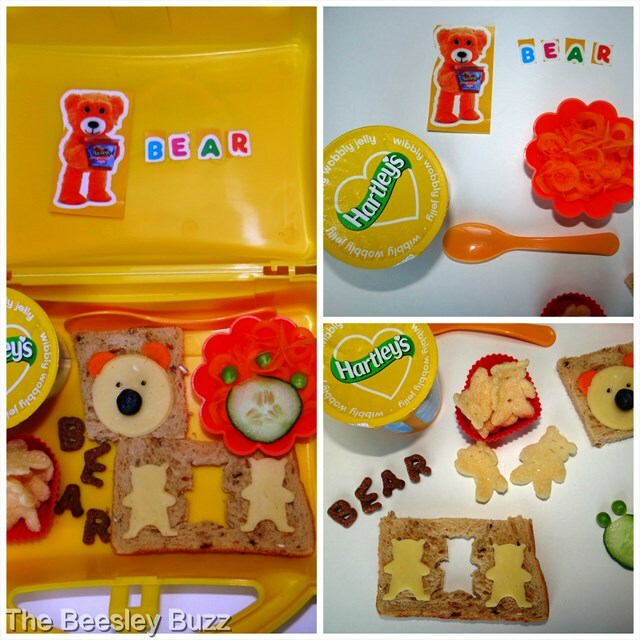 For Miss T's lunchbox idea I was inspired by the Hartley's bear and thought a teddy bear theme along the lines of a teddy bears picnic meets goldilocks would be good. Spiralised carrot for goldilocks hair. A paw print made of cucumber and podded fresh peas (you could use frozen peas as they'll defrost by lunchtime). Using a bear cookie cutter, we cut bear shapes from cheese slices and one from a slice of bread as a contrast. The bear face is made from bread, a circle cut from a cheese slice, a blueberry nose, carrot ears and edible pen eyes. Then its was just the finishing touches...BEAR spelled out from cereal letters, and a popular bear shaped potato snack. Finally instead of a pot of 'hunny' for our bears we've got a pot of delicious Hartley's no sugar jelly - Yum! Oh and don't forget to pop in a little spoon to eat your jelly with. If you need any special occasion bear inspiration, you can see the cute bear cupcakes that Miss T had for her birthday here. Our middle son adores fruit so we've gone with a fruity theme for this lunch box. 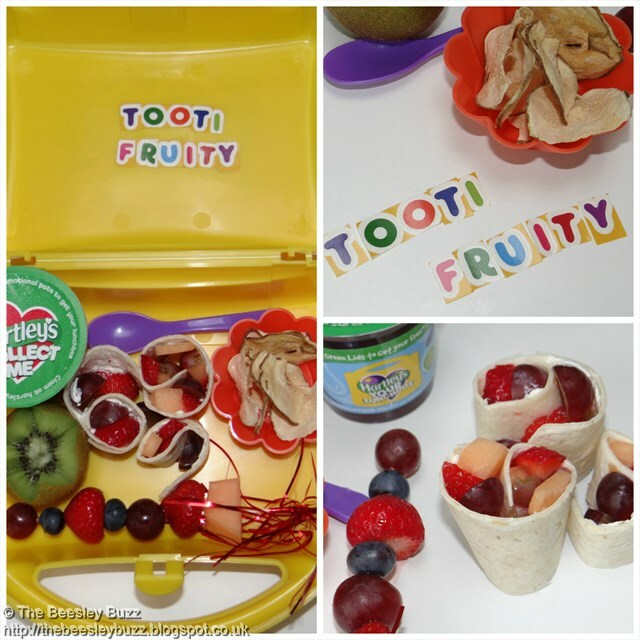 We made 'Frushi' (fruit sushi) adding chopped strawberry, grape and melon onto pieces of wrap that had been spread with cheese spread and rolling them up. Fruit skewers are always fun for kids. A kiwi was cut open like an egg to be scooped and eaten. Instead of regular crisps, we've used some of D's favourite 100% natural fruit crisps which he adores - This was the pear variety from Nim's Fruit Crisps. And of course a fabulous fruity flavoured Hartley's no added sugar jelly pot. Top Tip: Use silicone cake cases as handy little pots to create little portions of food as we've done here for the fruit crisps and before for the spiralised carrot. Our eldest has always had an interest in space so we decided upon a Space theme for his lunchbox. He would normally also have maybe a ham sandwich too (that could be cut as a star) or a boiled egg or babybel (they could be planets) too but this gives a few ideas on how to theme everything else. The Hartley's Jelly pot played an important roll as the base of the rocket! A wrap decorated with half a grape stuck on with cheese spread made the top half of the space rocket. 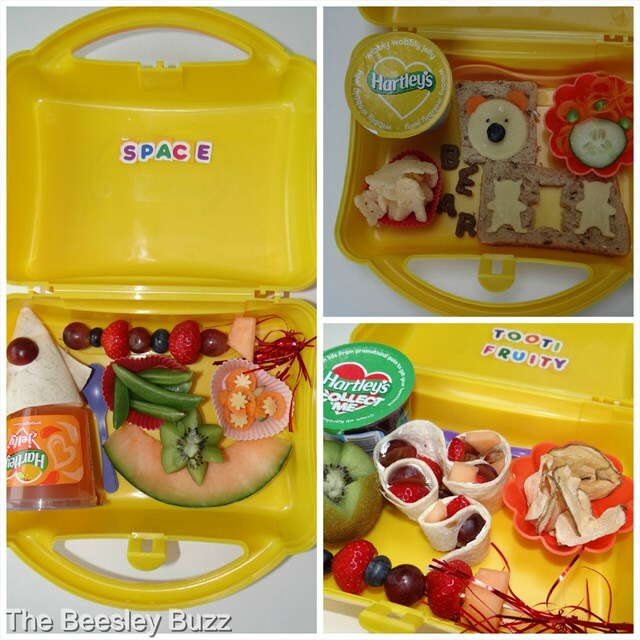 Stars and moon shapes were made from leftover pieces of cheese, fruit and veg from the other two lunchboxes. Another fruit kebab to make things easier for mum. This time the fruit kebab could be a firework style rocket shooting into the air. Top Tip: If you have more than one lunchbox to make in the mornings, try to use the same ingredients to make life a little easier. As you can see, there are lots of different ways to use the same ingredients. Use cookie cutters to cut sandwiches, bread, cheese, ham and fruit and veg into more interesting shapes. Use silicone cake cases and portion dividers for things like crisps and fruit. Use the same ingredients in different imaginative ways to keep your shopping list simple. 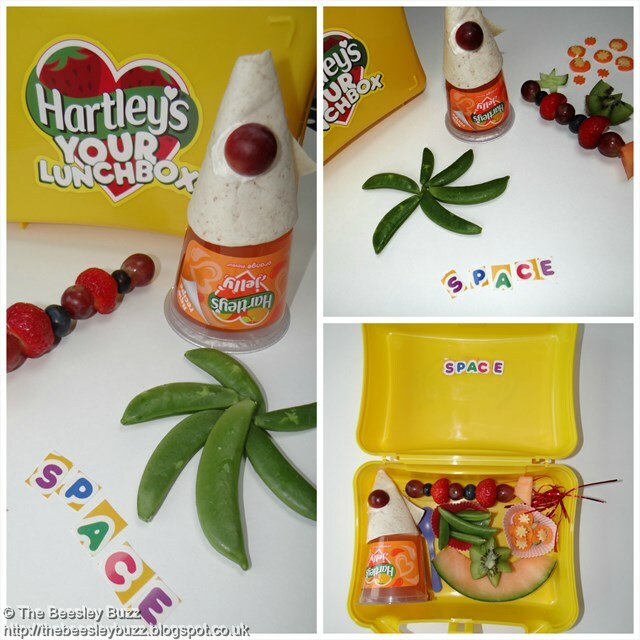 Remember you can get your own Hartley's Lunchbox and stickers by collecting those special edition lids. We received a lunchbox, stickers and 2 pots of Hartley's Jelly for this challenge. All opinions are our own. We saw that famous quote in the shop window of a bookstore in London at the weekend. And how true it is. I'm sure we all have childhood memories of being transported to far off magical lands simply by picking up a book. As grown-ups we often look forward to that escape we get from picking up a good summer read and join the characters in that book wherever in the world they may be. Penguin are encouraging us to 'head anywhere when you travel #ByBook' this summer with a selection of reads they are showcasing for summer reading. Take a peek at some of their recommendations here which will transport you to far off places from Vietnam to Cairo to California when you travel by book. 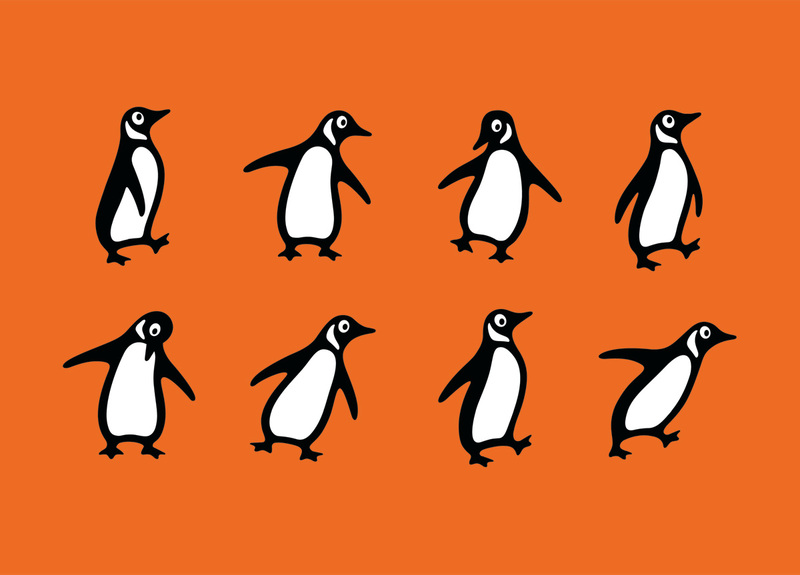 Being a family who loves nothing more than immersing ourselves in a good book, what we love about Penguin Random House is that whatever age you're at, there is something for everyone. From their Ladybird imprint for the younger age group (Miss T adores her Ladybird books) to Puffin for older kids (my boys find Wimpy Kid hilarious! ), Penguin books will see you through from preschool, through school to adulthood. Disclosure: Penguin will be kindly sending us some summer reading. 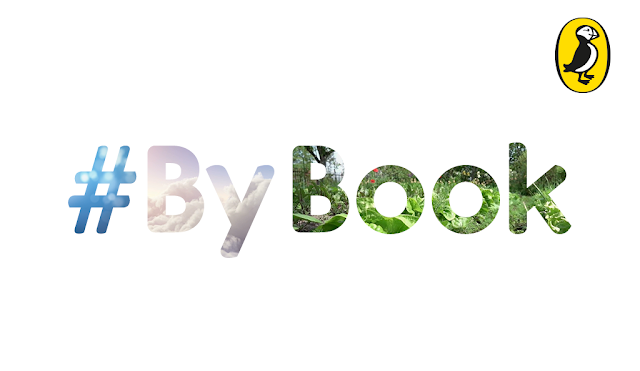 We've not been asked to write this post but as we love reading so much, we want to share our passion for it!